• A two per cent discount will be given to company cars using hi-blend bioethanol will be permanently reduced on biofuels used in off road transport such as trains. Whilst these cautious proposals are a welcome, yet so much more still needs addressing. Transport for one has been sidestepped. Growing aviation was not addressed (especially in light of yesterday's open skies aviation deal which will bring an anticipated 50% increase of transatlantic air travel over the next five years), nor was the need for investment in better public transport infrastructure to encourage drivers to forsake the car for attractive alternatives. There is still the need to tackle waste at source - introduce a plastic tax and retailers will reduce their packaging overnight. In the home, further incentives will be needed to help off set the high initial costs of installation, and existing stock has not been brought under the same umbrella as new homes. This Budget reminds me of 1970's transport caf food. It was served up with a bit of wilting garnish on the side - gave a bit of colour but was in reality of little additional substance. Problem is, now that I understand the nutrient value of a good bit of greenery, I want the full-on salad experience to go with my meat. Gordon, if this is an indication of your leadership on environmental issues you need to think more like that other Gordon. 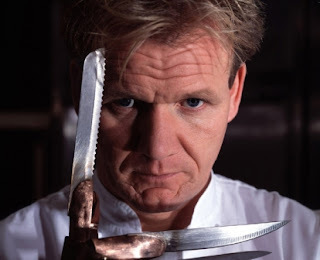 Be more like Mr Ramsay: bold, brave and without the bulls**t.